The final bell rings, signaling the end of the last day of school. It’s summer vacation! While the kids in this classroom learned much of the same material over the last school year, they will go off to have drastically different summer experiences. Summer is a crucial time for kids to continue learning. Unfortunately, studies show that more than 80% of kids from economically disadvantaged families lose reading skills over the summer because they lack access to books, learning resources, and enrichment opportunities. In Gunnison County, 15% of families are in need of assistance to ensure their kids continue learning over the summer. By providing a free opportunity to read a book, you can work to make sure that no child in Gunnison County is falling behind on reading over the summer months. 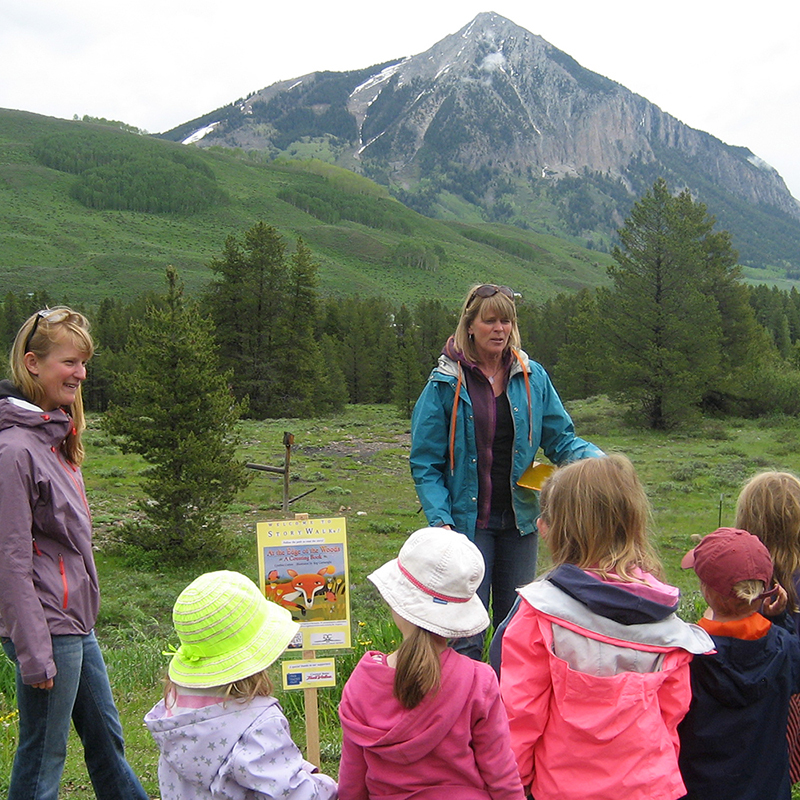 For the last two years, your support has allowed us to partner with the Crested Butte Library to offer StoryWalk® to the community, for free. A children’s picture book is deconstructed, and each page is displayed along the wide path of the Lower Loop. Children move through meadows and forests, reading each page as they come to it. The walk is short and easy, allowing kids to enjoy a story and explore their natural surroundings at the same time. All parents know that hiking with young children can be quite a challenge. But the long-term rewards are worth it. Spending time in nature has been shown to increase attention span, reduce stress, and help kids stay active and fit. When kids connect to nature at a young age, they are much more likely to develop a conservation ethic and love for the land. They are more likely to grow up to protect these places that you love. By providing a free opportunity to read a book and connect with the natural landscape, you ensure that kids like Adriana’s grow up to be the next generation of conservationists. We’d like to thank our funding partners, the Crested Butte/Mt. Crested Butte Rotary Club, and the Crested Butte Creative District. Thanks to their support, the project is under way. However, we need you to ensure that we can complete StoryWalk® and provide more projects like this in the future. Can you help right now? The StoryWalk® grand opening is scheduled for Thursday, June 22nd. Snacks, fun, and nature provided! The StoryWalk® Project was created by Anne Ferguson of Montpelier, VT and developed in collaboration the Kellogg Hubbard Library. Storywalk® is a registered service mark owned by Ms. Ferguson.